It is my pleasure to share with you that after an immense success of The Jewellery Book, my second book International Wedding Jewels has been published by Crystal Art Publication, New York– a marvelously comprehensive wedding journal that furnishes a wide array of wedding jewellery ideas collated from 47 international jewellers. Illustrating in detail the tradition of adorning oneself with exquisite jewellery on important occasions like weddings. Marriage, the most beautiful and divine unison of two hearts and souls, is also the time when families of the bride and the groom forge new bonds. Amongst all the festivities and celebrations, jewellery adds the perfect effervescence to the whole wedding. Women across the globe are fascinated by jewellery since childhood and it is their wedding when they really get to invest in their dream jewels. Gifting jewellery is also one of the most beautiful ways to express happiness for forming new relations, not only to the bride and groom but also to their loved ones. This has been a tradition across cultures, regions and times for ages. 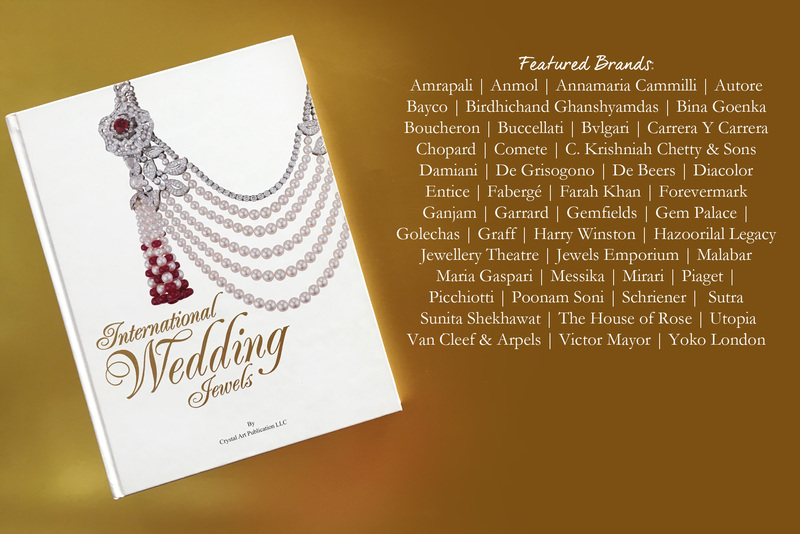 Right from the proposal to the bride, her trousseau to the gifts that she receives, the groom to the families on both sides, the ‘International Wedding Jewels’ book looks at various aspects where jewellery plays a crucial role at weddings from around the globe. Taking cues from global wedding jewellery trends and latest jewellery collections from various international jewellery houses, the book is a visual feast from one page to the other. With Preeta Agarwal and Pakshal R. as co-editor and their combined experience of over 15 years in the fine jewellery industry at work, this book has been compiled solicitously to cater to the ever growing wedding jewellery market and it gives you insights to make it memorable. It takes you inside the design studios of the most famous brands from across the globe and how they interpret wedding jewels that are adorned from head to toe. This book is complimented with beautifully shot images of jewellery that showcase the best of diamonds, gemstones and meticulous craftsmanship that these jewels come with. Turn the pages and behold the sheer immensity and variety that lie ahead for you to find awe-inspiringly beautiful bejewelled pieces that enrapture- be it a pair of earrings, necklace, bangles, chain or whatever you choose. Amrapali, Anmol, Annamaria Cammilli, Autore, Bayco, Birdhichand Ghanshyamdas, Bina Goenka, Boucheron, Buccellati, Bvlgari, Carrera Y Carrera, Chopard, Comete, C. Krishniah Chetty & Sons, Damiani, De Grisogono, De Beers, Diacolor, Entice, Fabergé, Farah Khan, Forevermark, Ganjam, Garrard, Gemfields, Gem Palace, Golechas, Graff, Harry Winston, Hazoorilal Legacy, Jewellery Theatre, Jewels Emporium, Malabar, Maria Gaspari, Messika, Mirari, Piaget, Picchiotti, Poonam Soni, Schriener, Sunita Shekhawat, Sutra, The House of Rose, Utopia, Van Cleef & Arpels, Victor Mayor, Yoko London. Or you can also write to me for a copy of the book. Hope you enjoy reading it as much as I enjoyed working on it. Congratulations Preeta ! Well done ! Do come by with a signed copy for my library and also address the students on your wonderful Journey !